I've heard it's that time of year where sweaters are worn. Well it's in the 60s and 70s here, with no snow in sight. Since occasionally we have cold weather (and I'm normally cold...remember how I normally write while snuggled under layers of blankets and a cat or two) I have lots of sweaters and cardigans. They get worn out and need replacing. Though I tend to keep the old ones to wear during messy and cold tasks...say spray painting outside on that rare cold day...you can also upcycle them and turn them into more useful and lovely items. If you don't have any old sweaters...perhaps like my friend Jennifer who mistakenly moved to Washington state for a few months with her kids, and recently moved back to Florida...you need to go to thrift stores. There are many old sweaters there in need of a serious update. I love a Cosby sweater as much as the next 80s kid, but if you aren't a hipster, you should turn them into something nicer...and even then, you should. 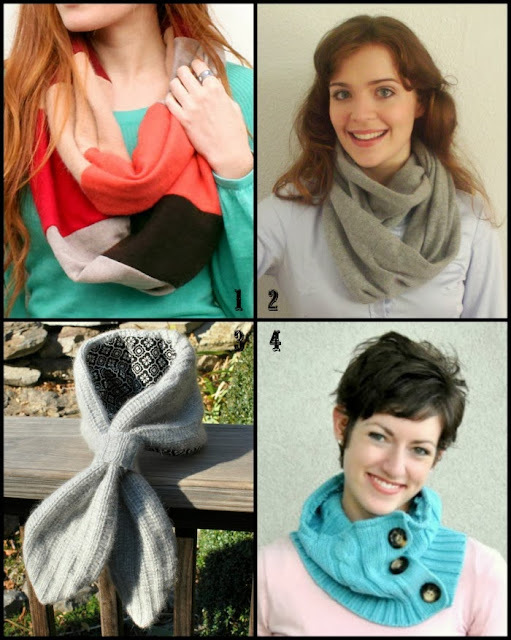 Here are a collection of tutorials showing you how to upcycle old sweaters. I know, I know, I was just talking about turning sweaters into something else. You're probably thinking about non-clothing items, and trust me, we'll cover that in a moment. I can't talk about upcycling sweaters without mentioning my favorite old sweater life giver, Katwise. Perhaps you've seen her work and perhaps you haven't. Either way, watch this short video showing how she cuts up multiple old sweaters and sews them into a magical rainbow sweater coat. Perhaps after watching that, you are thinking, well what does that have to do with ME upcyling sweaters! It just so happens that Katwise sells $9 tutorials in her Etsy shop. Say you have a stack of old sweaters...from family, yourself, and or thrifted...and want to make something big from them. Katwise can help you out with that. Though if you aren't up to that task or able to sew that well, you can also buy finished sweater coats in a variety of colors and styles. According to her Etsy shop announcement, she's having a big sweater sale in January. Break out your holiday money for that! The most common sweater reuse I see is scarves. I normally see straight ones, so I wanted to share a few newer variations. You can use multiple or one sweater to create this. It's all about looking at the sweater in a different way than normal. Of course with a scarf, something to keep your head warm is needed. 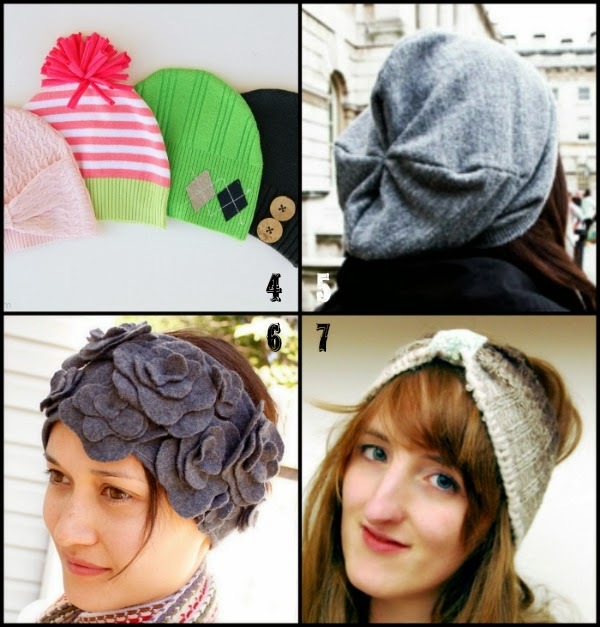 Sweaters are so warm that they are perfect to be reused for headwear...from hats to ear warmers. While we're on traditional Winter wear, gloves are a must. Cozy up those hands with some mittens or arm warmers/fingerless gloves. 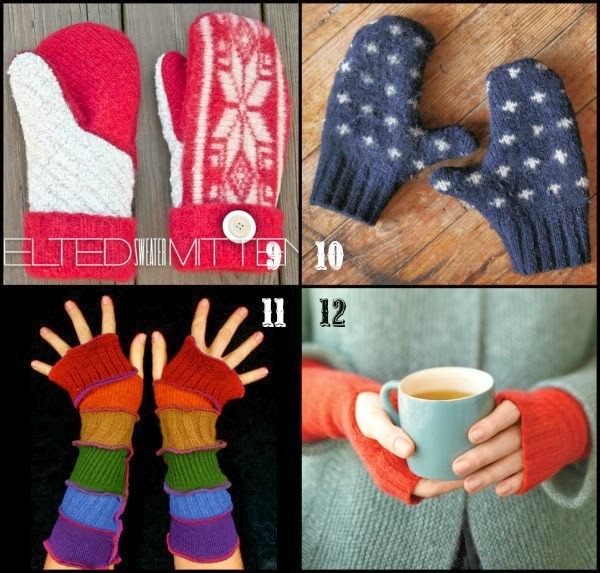 These different styles show how you can make gloves out of one or more sweaters. Great for worn out sweaters that still have a little life in them. Felt wool sweaters to keep your fingers and arms warmer. You can make them short to long. That's all about your personal needs. These sweater reuses are non-traditional legwear. Two different styles of boot socks, and some special cold weather wear. I love bootsocks. 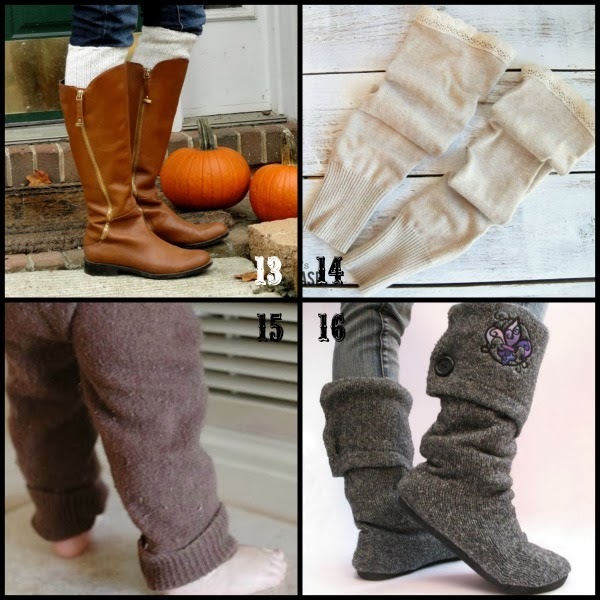 They can easily add more bulk and warmth to boots around the leg, without compressing the feet more. Make them long and slouch them down, or short and sweet. 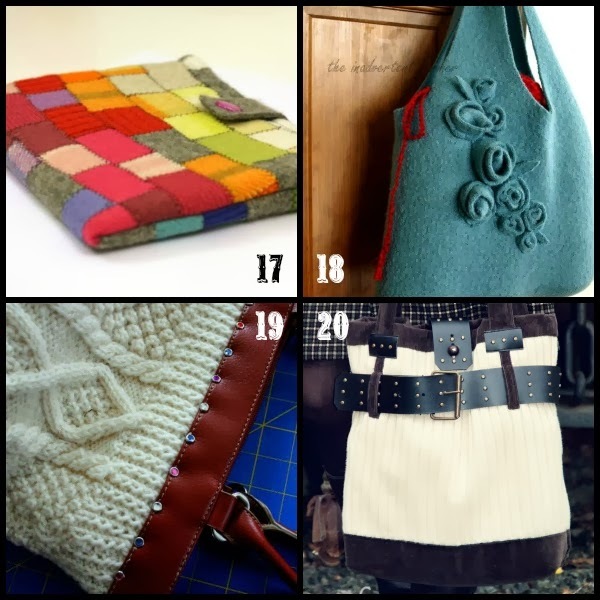 While turning sweaters into bags isn't about warm, it is about style. The felted bags are durable while the cable ones are for looks. I love when bags have a nice tactile quality, since we handle them a lot. It's important for them to look nice, but also be sturdy and comfortable. 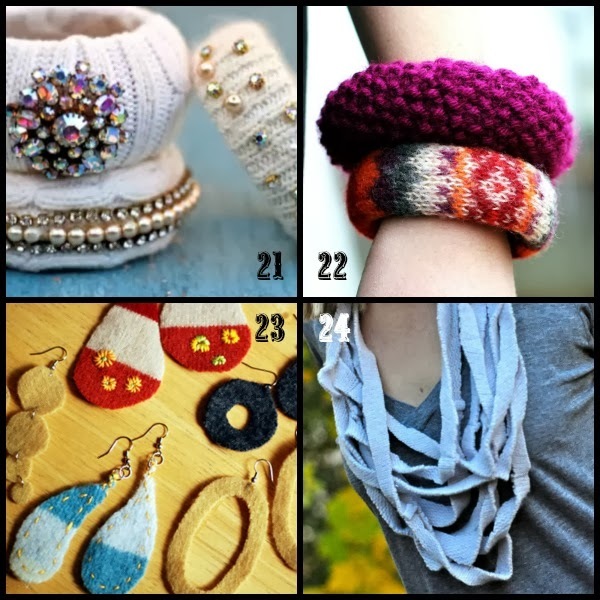 The last ways to reuse sweaters are for jewelry. Sweaters have great texture. These are great ways to use up scraps...perhaps left over from the above projects. You don't need much sweater fabric to make a piece of jewelry. It's all about the look and style you like. If you like any of the above project categories, feel free to pin those collages for future reference. For individual photos, follow the links to each project you like. To save all 25 of the Sweater Upcycling projects, PIN THIS IMAGE! 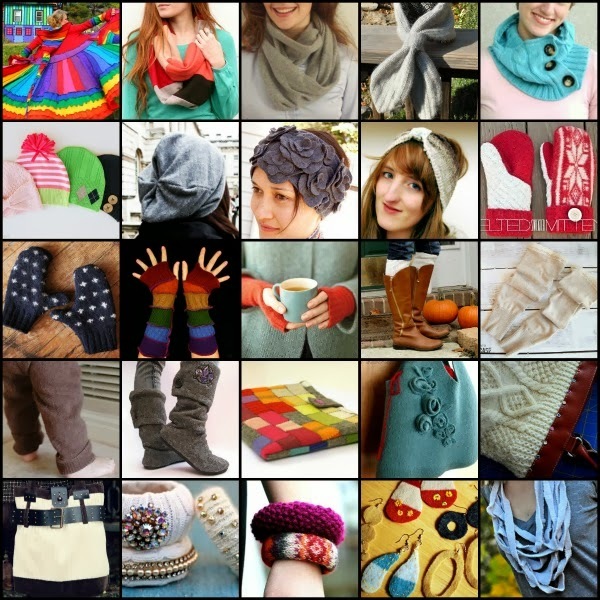 I hope these projects inspire you to reuse old sweaters for new things. Stay warm and stylish, and use your creativity! Happy Makery! Thank you for linking at my tutorial! Sorry, I have noticed it pretty late! I wanted to inform you that I have a new and updated version of the beanie hat. You can download a free printable pattern and step by step photographic guide to an awesome recycled beanie hat here: http://eepurl.com/BGmy5 Thank you so much!